It was great to hear from Martin Slater and even better to be asked to work with him on graphics and information for his project for Al Mahatta Air Museum in UAE. Martin's very probably the best engineer I'll ever have the privilege to meet, so any project of his is going to be pretty special. In this case he's providing a 40ft front section of Super VC10 ZA149, which heads off for United Arab Emirates any day now. It's to be mounted on the outside of the main building, and will be ringed by huge windows so that the lights from inside the building will play along the fuselage. 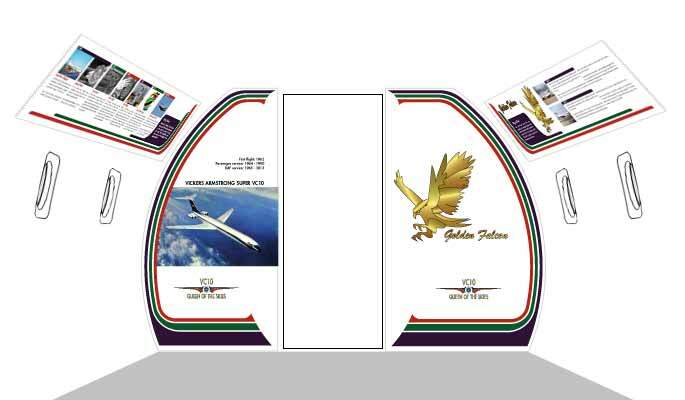 It looks spectacular in its Gulf Air Golden Falcon livery, so it's going to make a magnificent centrepiece for the museum. Martin's given me pretty free rein on the content of the information graphics, which is both generous and very, very brave! Such a relief though to be working with old aeroplanes again, especially something as graceful and awe-inspiring as this magnificent Queen of the Skies. It's sad to see such an iconic aircraft cut down like this, but far better that she can still delight visitors and share her history. I hope to be able to go and visit her in her new home and sit again in that huge, dial-peppered cockpit.